A team of Japanese and German researchers have carried out the largest-ever simulation of neural activity in the human brain, and the numbers are both amazing and humbling. The hardware necessary to simulate the activity of 1.73 billion nerve cells connected by 10.4 trillion synapses (just 1 percent of a brain’s total neural network) for 1 biological second: 82,944 processors on the K supercomputer and 1 petabyte of memory (24 bytes per synapse). That 1 second of biological time took 40 minutes, on one of the world’s most-powerful systems, to compute. If computing time scales linearly with the size of the network (a big if; I have no idea if this would be the case), it would take nearly two and half days to simulate 1 second of activity for an entire brain. Although they’re measured in FLOPS — floating point operations per second — rather than bytes, the prefixes measuring supercomputer performance are the same as those measuring data storage. A system operating at 1 exaflop would be 1,000 times more powerful than a system operating at 1 petaflop. 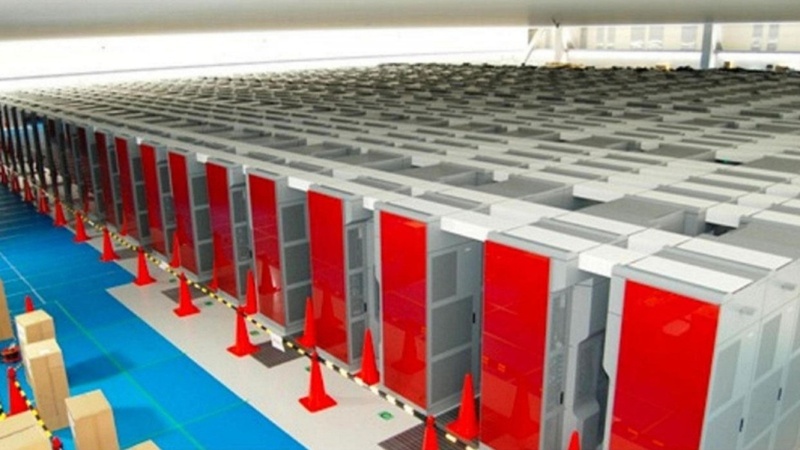 K — now the world’s fourth fastest supercomputer — is capable of 10.51 petaflops. Importantly, though, the recent simulation was merely a test of the open source NEST simulation software the researchers have been developing. Research into specific diseases, and projects such as Europe’s Human Brain Project and the United States’ BRAIN initiative, will require more job-specific tuning. Figuring out the mysteries of the human brain isn’t just a matter of sheer scale and advanced software, though. As GigaOM’s Stacey Higginbotham has reported, numerous companies and institutions, including IBM, are working on projects to better our understanding of the brain. Some are even developing chips designed to mimic it — albeit on a much smaller scale. This article was updated at 11:34 p.m. on Aug. 3 to correct the amount of memory allocated per synapse to 24 bytes. Feature image courtesy of Shutterstock user StudioSmart. What qualifies as “brain activity” exactly? The entirety of a person’s mental life? I would like to see what kind of tests were employed to validate the findings. The human brain truly is amazing! Did they do it in Java? It doesn’t. Even assuming that computing time scales linearly with the number of neural connections (probably a big underestimate), then computing time would go with size^2. and the brain operates on a clock frequency of 10Hz …so it must be a massively parallel processor with dedicated circuits for specific tasks. So, this is quite interesting, but didn’t they forget that a brain is not only a neuronal network ? There are chemical processes, hormonal processes and electric field process that all interact. Try brain scientist Eccles and Philosopher Popper on this. I’m getting mad when I read, that a positronic brain is in reach. There’s nothing in reach for the next hundred of years. What do you think is the amount of processors and memory to reproduce the above scenario ?? Maybe we are simply doing it all wrong. How many gears from a mechanical computer does it take to simulate a micro processor? If we were to one day to closely simulate the brain, I am sure the method will not involve computers as we know them today. Fascinating! Now, the essential question is whether consciousness is a emergent property of the activity of the brain. If so, this is a step toward our leaving these bodies behind. If not, then our having fantastic companions! theology has already proven that it is not so. Moore’s law was disproved years ago. so, if Moore’s law continues (processor power doubling every 2 years), we’ll have a positronic brain in … 24 years? The results are much better and it proves one thing that, computers are approaching the limits of our brain ! This scares the living daylights out of me! wtf was simulated for that 1 second? my guess is the end-of-death split second, that way they got something cool and still had a little time left over…? Very promising. The article does not go into detail about what exactly was simulated – was physics and chemistry of brain matter accounted for along with neurons? Pretty incredible to think that the brain does this so naturally and yet we can’t get other things to operate in nearly the same amount of time that the brain takes to do it. It just took 200 million years for brains to evolve. You can go with that baseless assertion or you can be in awe of the creator who spoke the world into existence! There are literally millions of tons of evidence for that assertion. If you had read any book on biological evolution you would understand that. The only assertion that’s baseless is the one about a creator which has no not a single shred on evidence. Embarrassing. no, there are millions of tons of lies for this assertion. The assertion you are talking about is mere speculation that always begins its propaganda course from when you’re five and onward. Remember, most scientists do not become theists because they were born in a religious family, they discovered it later in their career. There is almost no other path to theism in the scientific community. And secondly, there is basically no evidence in the whole evolutionary theory about organisms gaining new information, or in your case, evolving from simple to complex. In fact there is lot’s of contrary evidence to that beginning from first and second laws of thermodynamics and onward. What I’m saying is, the brain evolvement is a big unscientific philosophy based on mere imagination. If you dig deeper, you will discover there is a lot of such imaginary work that pops up in scientific journals and books. The best fairytale I read to prove evolution is the theory of multi-verse that has absolutely 0 scientific evidence, yet it is highly applauded as brilliant thinking among scientists. It’s brilliant pure fiction, but has zero scientific basis. If you read any works about mutli-verse, it will all sound scientific as if it has a lot scientific evidence, but all it is is one fictional work, based on another scientific dream, seasoned with other sprinkles of theories, all based on nothing. But because multi-verse has it’s roots in evolution, scientists propagate it, repeat it, talk about it, and we the people who have no clue what they are talking about soak it up and run with it believing we’ve gained so knowledge. Following your line of thought, then lack of evidence must mean that a higher being or deity exists and that it created the universe (for us), many people believe that where there’s no scientific proof in any subject, e.g. biology, physics, astronomy, etc. then that’s exactly where God IS, think about it, before we knew better, God determined each and every aspect of our lives, now we know not only that the earth is not the center of the universe, but that we’re less to the universe than a virus is to us… then God has lost a lot of ground since the dark ages. I often wonder If God really did created all that stuff, then how could we possibly think that we could reach such a being, by praying? are we really that naive?, coming from a religious background I have looked for any piece of evidence other than personal speculation or faith to support God’s existence and I must say each day I’m more convinced that we, as humans, prefer to believe a lie than to face the fact that not only there’s no such being, but there isn’t either such thing as a soul or any sort of life after we die. I can’t imagine how a non religious scientist would discover the path to theism in his/her career, actually if i’m not wrong the rate of theist scientists has drastically decreased since the illustration period. Of course something like that would come to a shock to so many, and many will feel like they have empty lives. Well, I say we do not need commandments coming from a higher being so we know how to behave, specially if they are just common sense, and I say we alone have the power to do good, and we must do good not because someone tells us to, but only because we can, because we have a choice, and because we can own our actions and desires. We are obliged to make our world a better place for future generations, and we must above everything else keep learning and discovering new frontiers for our intellect, we are our own gods. Do you think itÂ´s really reasonable to think in evolution without a direction? Evolution moves forward as more suitable genes are selected simply to survive more and better. Simple as that. The “direction” is a concept created by us. Nature does not need to conform to our conceptions. And guys, please, evolution does not state that there is no creator. It makes no comment about it. There can be a creator and evolution can still be possible. Please stop perceiving the argument as creator on one side and evolution on the other. Evolution has tons of directions all at once. There is no evidence for macro-evolution (referred to as simply, evolution), but there is lot’s of evidence for micro-evolution. Micro-evolution is nothing more than having two different dogs begat another breed; dog species as we know it always evolve, but always within its kind. People who believe in evolution do not understand that often what is spoon fed to them as evidence for macro-evolution is actually repackaged micro-evolution. Even Bible talks about micro-evolution using the term “after its kind” or “after their kind”. Yep, nothing like blood to keep the body cool.